The social media giant has been gradually reducing the amount of branded content it displays in its users’ News Feeds thus hurting the visibility and exposure of eCommerce posts. Facebook’s Head of News Feed explained that the idea behind this move, unpopular with business owners and brands, was to make this feature more about connecting people and less about consuming media in isolation. Fair enough, but where does this noble cause leave more than 60 million business pages including your eCommerce store? Not hanging in the air, luckily, because you have a powerful ace up your sleeve – Facebook Ads. It’s true that you’ll have to pay, but the good news is that the price tag isn’t hefty. 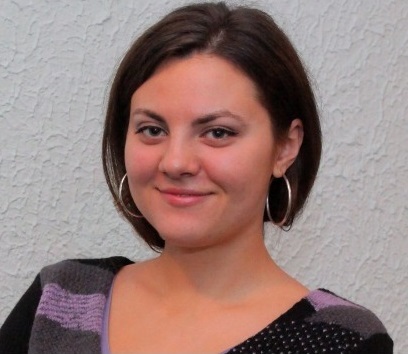 For just $50 you can reach somewhere between 5,000 and 10,000 people with your message. Using catchy images, charts and graphs, memes and pop-culture references, or before-and-after illustrations will make your Ad click-worthy. While the compelling copy is a must, stunning visuals can make a big difference as both the Facebook algorithm and users favor them over textually-rich content. Moreover, the human brain is capable of identifying and processing the entire images within just 13 milliseconds. No wonder that video marketing content can boost your conversion rate by 800%. Your audience won’t have a good reason to click on your Ad unless you tell them exactly how your offer will help them solve their problems and what makes it different from and better than all those similar products on the market. Think about giving a discount or including social proof. Your Ads will be effective only if they target the right people. Make sure to use the language, visuals, and offers which will resonate with your audience, or even better its particular segment. Otherwise, you’re wasting your time and money on people not interested in becoming your paying customers. A call-to-action is a crucial element of a successful and well-rounded Ad, as it adds a sense of urgency and tells your audience what exactly you want them to do. Use action words and make every CTA stand out in your Ads. Dollar Shave Club has been the darling of online marketing ever since 2012 when the company launched its viral video which brought in 12,000 new customers within just 48 hours. The business, now worth a stunning $1 billion, is a textbook example of how clever Facebook Ad campaigns, paired with other digital marketing efforts, can lead to a meteoric rise to success. The simplicity of the company’s Facebook Ad copy captures the audience’s attention at a single glance. So, this Ad covers all these above-mentioned rules and puts them to good use. This ad combines a creative image and a very cleverly crafted value proposition which visually highlights what makes their offer stand out from their competitors’ deals. As you can see, there’s not much text and grasping the meaning should be relatively straightforward. This reduces the time and attention needed for an ad to be successful. According to a Microsoft study, our attention span has dropped from 12 to 8 seconds. With this in mind, it may be best practice to stick to the “less-is-more” maxim when coming up with your Facebook Ad messages. 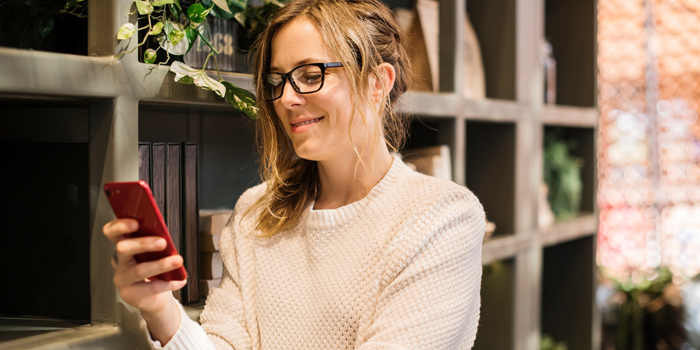 Given your customers’ hectic daily schedules and information overload, it is less likely that they will read a text-heavy ad about what makes your product so special. This startup which makes eco-friendly sneakers from sustainable materials such as merino wool, sugar cane, or eucalyptus tree fiber has taken Silicon Valley by storm. Dubbed “the world’s most comfortable shoes”, these kicks managed to challenge even a sportswear giant like Nike. One of the company’s Facebook Ads features a video which is completely in compliance with the above-mentioned short-attention-span rule, as it runs for only 9 seconds. It takes advantage of white space and focuses on the product – a pair of comfy, wooly shoes which allow the wearer to move their feet and wiggle their toes, all of which is shown in the video. Besides being completely visually-oriented, the message is supported by social proof, while the CTA says simply “Shop Now”. Despite the fact that there’s not much text, this Ad manages to state the most important and enticing factors which contribute to their customers’ quick decision-making. One of such clinchers is free shipping, as according to stats, consumers spend 30% more if this perk is a part of the deal. This brand of meal replacement has been a popular healthy alternative to regular food, despite being criticized for its allegedly bland taste which is nothing to write home about. 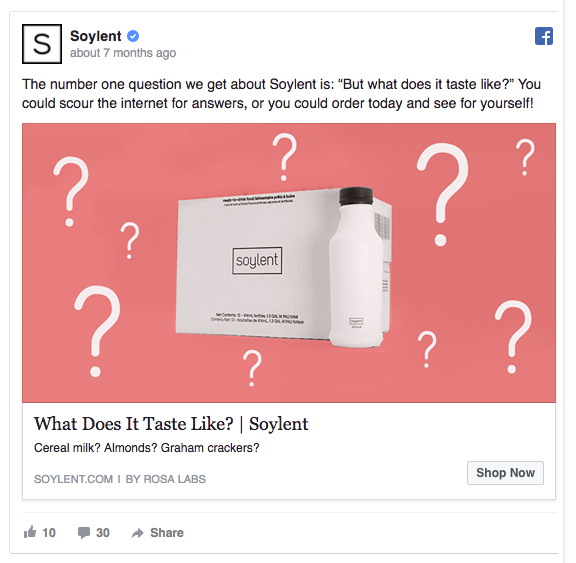 The element of mystery is particularly compelling, and the solution is pretty straightforward – the Ad invites potential customers to try Soylent and see it for themselves. The pastel visuals are reminiscent of a yummy smoothie or fruit yogurt drink. This Ad as a whole resonates with the brand’s target audience, who are curious about the taste of this drink, and it smartly turns the product’s perceived disadvantage into an opportunity. Using a friendly tone helps companies talk about their products, build loyalty and capture trust. It takes a neutral stance and gives them the freedom to make their own conclusions. Facebook is famous for its variety of different targeting parameters as it allows you to show your ads specifically to very narrow segments of your audience and take the guesswork out of your marketing game. This means that you need to understand what your customers want and need, as well as what their interests are. Old Navy is one of the brands which leverage this feature. The company offers a wide range of clothes and accessories for the whole family, and it would be totally ineffective to have just one single Ad which will cover casual or performance products, as well as those designed for men, women, or children. One of the brand’s Ads targets the people interested in fitness, and it offers them a discount of up to 50% on activewear items. This is an example of how relevant your Ads should be as that’s a surefire way of driving a lot of qualified traffic to your landing page. Slack is a set of cloud-based team collaboration tools, and their lighthearted Ad is all about fun, which is something that many employees don’t have thanks to an endless stream of meetings. 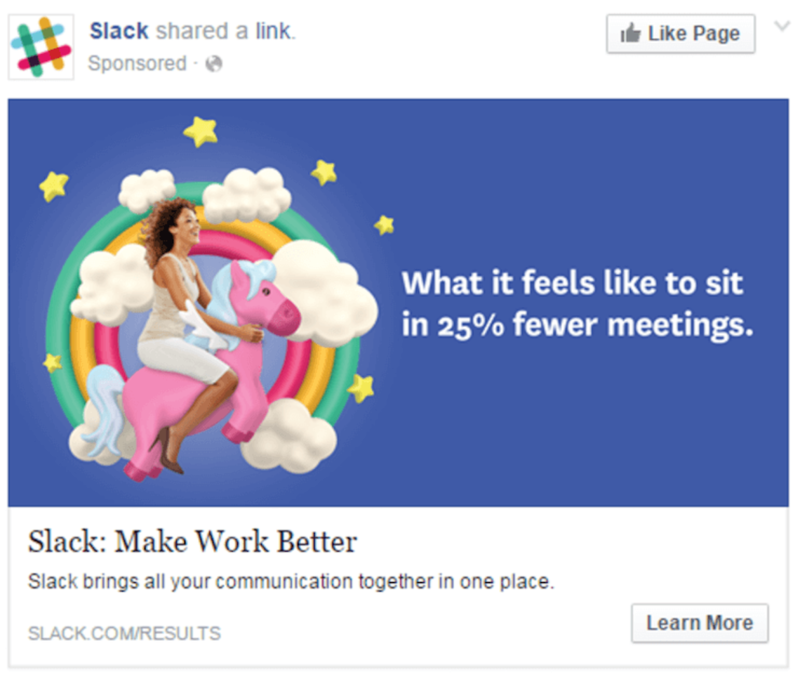 And Slack masterfully plays on that common pain point of most office workers by promising them 25% fewer meetings. The Ad doesn’t list all the features and functionalities as it manages to capture the target audience’s attention with that single promise. There’s no need to use the flashy industry jargon or elaborate specs because your audience only wants to hear how your product will make their lives easier. That’s exactly what Slack does with this dreamy unicorn-filled Ad as if it says that its audience’s work-related dreams will come true with the help of this communication platform. Of course, the creative, eye-catching visuals which are synced with the message and its tone create a perfect synergy of form and content. 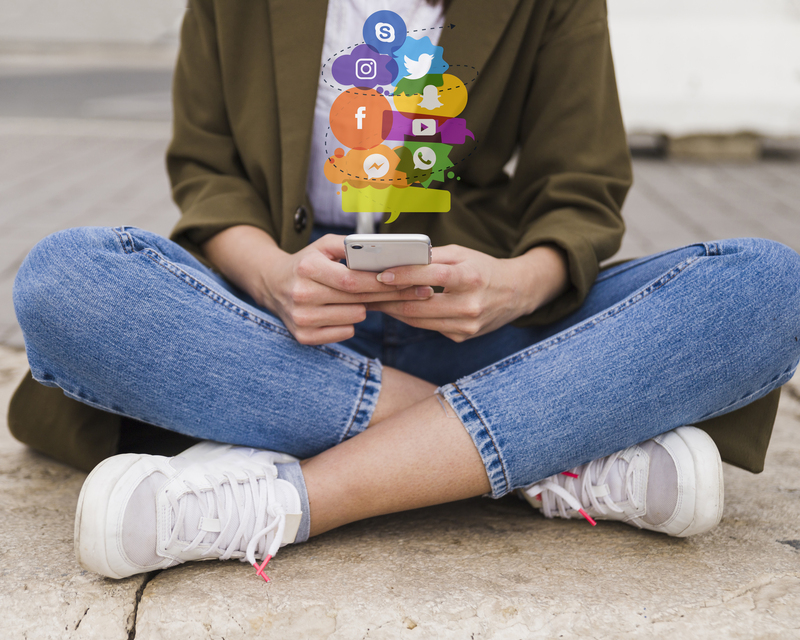 Tap into the power of Facebook Ads, and reach your audience in an effective and captivating manner, because relying on your organic reach will limit your market potential.